WFMW - Pizza in a snap! I don't know about you, but I LOVE pizza...I could eat it at least weekly, and probably several times weekly and never get tired of it - or at least not for a very long time! As anyone knows, pizza, even delivery, can get pricey if you like to eat it as often as I do or have a big family. Enter homemade pizza! I was determined that we'd eat all 3 meals at home this past Sat (and we did!! ), but in order to make that happen, mid-morning Saturday, I ended up throwing together the ingredients for pizza dough in our breadmaker. I love making pizza this way - 1 1/2 hours in the bread machine (read almost no work for me)...roll out the dough, add sauce, toppings & cheese and then a quick waltz through the oven and voila - we're ready to eat! Being the think-ahead-gal that I am (well, sometimes at least!) - I made a double recipe of dough - cut the extra into pizza sized hunks for later, and popped it in the freezer. Now if we want pizza for lunch during the week (like I did on Tues), I can pull out a dough-ball in the morning, let it thaw, and then have homemade pizza with almost no effort for lunch. This one definitely works for me! And best of all, my little guy was more than happy to enjoy pizza with me! 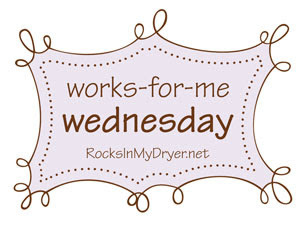 For more great WFMW ideas, head on over and check out Rocks in my Dryer! And - if you have an easy, delicious pizza dough recipe - let me know! I like the one I'm using okay (I like it better than DH does) - but would sure love to have a better one! Thanks! The Bloggy Giveaway Carnival is here - yippee!